The Best Places to Visit in Austria: Travel Blogger Barbara Wagner Recommends 4 Cities to Visit in Austria, Including the Most Interesting Tourist Places in Austria. Disclosure: This Best Places to Visit in Austria travel guide contains affiliate links. That means we may earn a small commission when you use the links on this site to book a hotel, buy your travel insurance, shop for travel essentials, etc.. You don’t pay anything extra. If you’d like to learn more about how this works, you can read more under our Disclaimer page. Situated in the heart of Central Europe, Austria is a beautiful country with a rich history, gorgeous cities, and beautiful mountains. Politically neutral since the end of the world wars (and break-up of the Austro-Hungarian Empire), Austria has long been an intellectual and cultural center of Europe, famous for classical music, opera, fine art and exquisite architecture. Beyond being a center for art and philosophy, Austria has some of the most beautiful mountains in Europe, including many famous ski resorts, such as St-Anton and Kitzbuhel. The Alps stretch across the western part of Austria all the way to Italy, making the country an ideal location not only for those who want to explore imperial history and learn about classical music, but also those looking for an outdoor and active holiday in the Alps. In this post, travel blogger Barbara Wagner shares her picks for the best places to visit in Austria for first timers. Lying on the east side of the Danube, Vienna has a little less than 2 million inhabitants and is a major cultural and intellectual center within Europe. The former capital of the Austro-Hungarian Empire, Vienna has also served as home to famous musicians and intellectuals, such as Mozart, Beethoven and Freud. One of the best things about visiting Vienna is touring its many palaces, including the beautiful Belvedere Palace, which today serves an art museum. The works of Austria’s most famous contemporary artist, Gustav Klimt, are displayed within the Belvedere (including The Kiss, his most famous painting). His work is beautiful, and I highly recommend everyone visit the exhibit while in Vienna. Once you’ve finished touring the Klimt exhibit and Palace interior, make time to explore the exterior of the Palace: it has a huge garden in the front, a lovely fountain in the back, and is a UNESCO World Heritage site. From the Belvedere, it’s an easy 30-minute walk to the city center and the Stephansdom. This giant city center church is the most important Roman Catholic church in Austria, and has a remarkably beautiful tiled roof. If you’re hungry or in need of a caffeine fix, your next stop should be Julius Meinl, a 10-minute walk from Stephansdom. The most beautiful supermarket in Vienna, Julius Meinl stocks products from all over the world and has on-site dining. A 4-minute walk from the supermarket, you’ll find yourself at the Hofburg Palace, the former imperial palace of the Habsburg family. 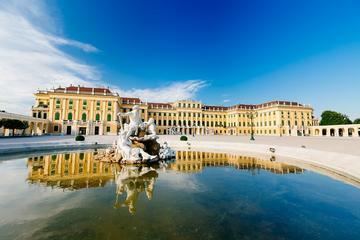 Built in the thirteenth century, it served as a winter palace, with the grandiose Baroque Schönbrunn Palace serving as the summer residence. If you have an extra day to spend in Vienna, you should definitely visit the Schönbrunn Palace as well. Finally, make sure to visit the National Opera, as it is famously one of the most beautiful opera houses in the world. If you’e looking for something a bit more unique, there are also plenty of off-beat things to do in Vienna, too! Get a Vienna Pass + Hop-on-Hop-off Bus Pass, and get access to top city attractions including the Schönbrunn Palace,Hofburg and more. From $63.73. When you get hungry, my favorite restaurant in Vienna is Palmenhaus, which used to be an old railway station and is now a greenhouse filled with large palm trees, and a restaurant. If you want something more typical, Mariahilfer Strasse is Vienna’s famous shopping street, and is filled with restaurants catering to tourists and serving Wienerschnitzel (breaded, fried veal), a local specialty. Vienna also has some fabulous pastry shops, and tasting the Sachertorte, Austria’s most famous cake, is a must. Even John Lennon mentioned it in his song Ballad of John and Yoko. Only slightly less famous than Sachertorte, strudel is another typical Austrian pastry visitors should try. Salzburg is only a three-hour train ride from Vienna. It is the second-largest city in Austria, and an important cultural center within Europe. Salzburg’s Old Town is a beautiful UNESCO World Heritage site, made famous for being Mozart’s birthplace, and the filming location for The Sound of Music (die-hard Sound of Music fans can even take a special tour of the city!). It’s an important city for classical music, and people from all over the world come to Salzburg to learn about Mozart and classical music. A few must-dos in Salzburg include visiting Mozart’s birth house and walking up one of the city’s hills to see the city from above. Mönchsberg and Festungsberg are the most popular, and the views are amazing; you can see the entire city and river below. Walking along the river is also a beautiful stroll. Heading to Salzburg with kids? Check out this guide. When you’re finished sightseeing, make sure to visit the Sacher Pastry Store at the Sacher Hotel to try one of their delicious cakes. For dinner, I recommend a local restaurant called Zum Fidelen Affen, which is famous for its authentic Austrian dishes. Usually, you’ll have to wait a while for a table, but the delicious local specialties make it worthwhile. Worth noting: Salzburg is a very popular tourist destination, and hotels prices and availability reflect this: most rooms sell out quickly, even in low season, so book your accommodation well ahead of time. From Salzburg, take the bus (about two hours) or train (about one hour) to the nearby village of Hallstatt. A small alpine village, Hallstatt is a UNESCO World Heritage site and one of the most picturesque towns you’ll ever see. The village was built around the lake, with sixteenth-century alpine houses lining the lakeshore. It is the oldest, most photographed village in Austria. Over the years, Hallstatt has become a favorite destination among Chinese tourists, attracting thousands every year, and inspiring a full replica of the town to be built in China! Hallstatt’s mayor attended the opening in 2012, signing a cultural exchange agreement in the hopes it would attract more tourism to the ‘original’ Hallstatt. Beyond the scenery, the Gothic-style Catholic church in the center of the town is a main attraction. Spend your time walking around town and taking photos, and stop in at one of the local restaurants for traditional goulash soup and the Austrian cheesecake, a specialty and (in my opinion) one of the best things the Austrians make. It’s possible to visit Hallstatt as a day trip from Salzburg, or as an overnight to enjoy the scenery. If you choose to stay overnight, Hallstatt is well-equipped to host you, and there are numerous highly rated pensions and holiday apartments to choose from. Innsbruck, the capitol of the alpine Tyrol region and a favorite destination for winter sports enthusiasts, is about 2 hours by train from Salzburg. Many of Austria’s most famous ski resorts are near Innsbruck, and the city has hosted two Winter Olympics and two Paralympics in the past. Innsbruck is well known for both imperial and modern architecture, and there are beautiful buildings and churches all over town. There are plenty of things to do in Innsbruck to keep you busy any time of the year. My favorite is the Goldenes Dahl building in the center, which has a “golden” roof (actually made of copper). Innsbruck is surrounded by mountains, which are often hidden by the clouds. It is a very charming city with an interesting culture, but it’s worth noting the temperature drops significantly when you reach the city, as it is situated in an alpine valley. Austria is a fascinating country, with a lot to offer visitors. With fantastic tourist infrastructure, some very picturesque towns, and beautiful mountains, it’s a great destination for people interested in history, classical music, art and the outdoors.